This sweet girl so wants a family to love her and keep her forever. Photo credit: The Community Cat Coalition. 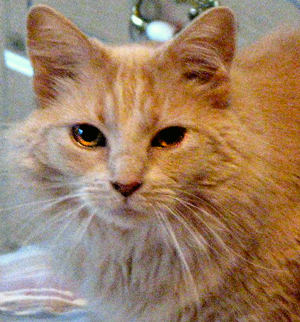 Janie – a soft peach colored cat, looking for a home that lasts…..the term forever home is bandied about lightly these days, to the point that we sometimes think it has lost its meaning. It certainly has in Janie’s case. Three times now she has lost her home, and through no fault of her own! In her first home, Janie was adopted by someone who declawed her, and then the owner decided she didn’t want her and released her back to a shelter. A second person adopted her but wanted her to be indoor/outdoor (not a good idea for any cat, but especially not appropriate for a declawed kitty) and when Janie wanted to be indoor most of the time she was returned again to the shelter. And finally a wonderful family adopted Janie last July, but sadly the father had severe allergies and she lost her home again. This time an independent rescuer agreed to take responsibility for her and help find her a loving home where she can live out her life with the love and attention that she deserves. Janie is a bit confused right now, not understanding why she keeps getting uprooted and moved from place to place. She is looking for a quiet home with someone who will give her lots of TLC and time to feel comfortable and adjust to her new family. She enjoys sitting on your lap (when she is in the mood) and even when not on your lap likes to be with you – and she really enjoys her catnip! When receiving attention she purrs up a storm while at the same time fans you with her wagging tail. Janie has lived with a small dog and done fine with him, but we don’t know how she will do with other cats. She is litter box perfect, but does expect it to be cleaned regularly. She is seven years old, the perfect age and old enough to not cause destruction in a home, but young enough to enjoy play and interaction. A recent health check showed no physical problems and she is spayed, vaccinated, microchipped, and viral negative. This delightful cat will be a wonderful companion for just about anyone but this time she needs a commitment from her people. Please do not consider Janie if you are not willing to make it a lifetime commitment; her next home needs to be her last. If you would like to find out more about Janie please email Chris at federle4@aol.com.